Come check out what's new in our ceramic bisque. From functional pottery pieces to decorative ceramic pieces, there's something new and exciting for everyone. Brighten any drink with our ceramic bisque beverageware. From traditional to whimsical, we've got the right unglazed ceramic mug or cup for your next round! Be the host with the most with our ceramic bisque collections! Wow the crowd or just a few with our unglazed ceramic serving platters or appetizer plates. Our ceramic bisque dinnerware will make any dinner a five star experience! Make leftovers and salads the stars with our ceramic pottery dinner and salad plates. Our bisque figurines come in all shapes, sizes and styles. They are perfect for a range of uses, from birthday parties to decorating your home, patio or garden. Our ceramic bisque holiday collections are the perfect touch to your home. 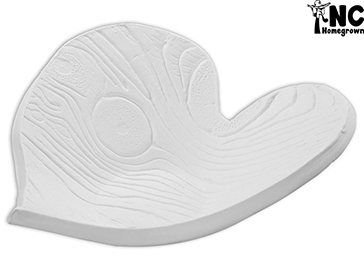 From heart felt to spooky, we've got the right unglazed ceramic piece just for you! Got an area that needs "something"? From whimsical pottery gnomes to adorable ceramic bisque trinket boxes, we've got that special home accent for you. There's not much better than homegrown! Our exclusive ceramic bisque Homegrown bowls, plates and plaques are made by hand right here in North Carolina. You'll find the perfect ceramic bisque banks and unglazed trinket boxes for your little mermaid or sailor to keep the spoils of their journeys in our Kidzone. Organize the heart of your castle with ceramic bisque Kitchenware. Unglazed ceramic spice jars and canisters keep the flavor in and a "case of the blahs" away! Stay on task with ceramic bisque office supplies. Display business cards in pottery card holders or keep your work space neat with ceramic coaster sets. Add magic to your garden with ceramic bisque birdhouses. Our Patio and Garden has the perfect pottery planters and garden stakes for your green-thumb! Round of ap-PAWS for pets! Now your furry family member can have great ceramic treat canisters and bisque food and water bowls that expresses their own personalities! Bring your veggie platter to gossip-worthy levels! Our ceramic bisque Serving items will have the neighbors scrambling for an invite to your next soiree. Bisque is our business We eat, sleep and drink Bisque. Try our Blue Label Bisque - Beauty, Performance and Strength. The earliest ceramic bisque was pottery simply created from clay and hardened in a fire pit. Ceramics evolved to use glaze or glass like minerals to produce a more colorful, impervious surface. Ceramics include industrial, domestic use, building products and artistic pieces. The word "ceramics" comes from the Greek word keramikos meaning "of pottery" or "for pottery”. The term “bisque” is of French origin and literally means “Twice baked”. Ceramic bisque is not twice baked – only until after the second glaze firing. So the use of this terminology is interesting – since ceramic bisque really is baked only once. Possibly the term originally implied that ceramic bisque must be baked once more during glaze firing to achieve the final product. In any case – ceramic bisque or biscuit refers to the initial kiln firing of raw dried clay. Earthenware ceramics is ceramic bisque made of porous clay fired at low heat of roughly cone 04-06 (around 1850 degrees Fahrenheit). Once this initial firing produces the bisque shape – the glaze will be applied to decorate the design and achieve a impervious surface. The terms “underglazes” and overglazes are modern terms indicating a color ceramics design (underlgaze) and a clear glaze cover coat (overglaze) to achieve a brilliant, durable finish. 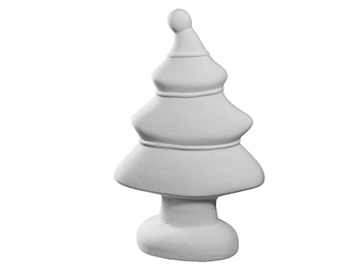 Bisque Imports ceramic supply includes a broad array of bisque designs along with the finest offering of Duncan underglazes and overglazes for all ceramic studio needs.